If you have a dog household and are thinking about getting a cat, or vice-versa, there are some things you need to know first. While cat and dogs can and do live together harmoniously, they can have very different personalities, and throwing them together without any thought or planning could be disastrous for all of you. To make this transition a little bit easier, there are some things you’ll need to consider. You can’t always determine how pets will interact based solely on their breeds; that’s why it’s best to know and understand the animal themselves. Get to know their temperament and disposition. 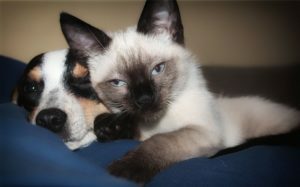 If a dog is possessive, he may not be a good fit with and independent cat. If a cat is timid, they may not be a good companion for an excitable dog. Your dog or cat’s personality will help guide you to do what’s best. Always remember, if you think you’ve found the perfect pet match and you end up being wrong…have an alternate plan. One way you can ensure you’re giving this the best possible chance is to make sure your dog is properly trained. If your dog climbs on cupboard or growls while he has a toy; chances are you need to do some training to break him out of this behavior. Once you feel confident about your dog’s behavior, set up a safe way for them to meet. You’ll want to do this in an area where there are no dog or cat dishes out, that will eliminate the need for the animals to be possessive. Let the pets sniff each other as they want but don’t force them to interact. If you feel like the meeting has taken a wrong turn, separate them. Once you bring your other pet home to stay, make sure to keep the dog and cat’s food and water in individual areas. My pet pail is perfect for this. The two 18.5oz removable bowls are perfect for your cat’s food and water while the 37oz bowls underneath will suit your dog’s needs. With My Pet Pail you can also load up both your dog and cat’s food and supplied to have in one convenient location while you’re traveling. My Pet Pail is both stylist and sturdy. Discover today why cat and dog lovers alike prefer My Pet Pail.